– Fresh off the release of his debut album, The Letter O, Damian Lillard is already dealing with disappointment ahead of the tip-off of the 2016-2017 NBA season. Just as his Portland Trailblazers were set to square off against the Utah Jazz, he got the official word that his Lil Wayne feature on the song “Loyal to the Soil” would have to be nixed. Although he didn’t specify the identity of the powers be who were altered his tracklisting, anyone who has been following Lil Wayne news this year can easily pinpoint to the culprit(s) to be the house Birdman built. “Unfortunately, I am being forced to remove Lil Wayne from #TheLetterO track “Loyal to the Soil”. 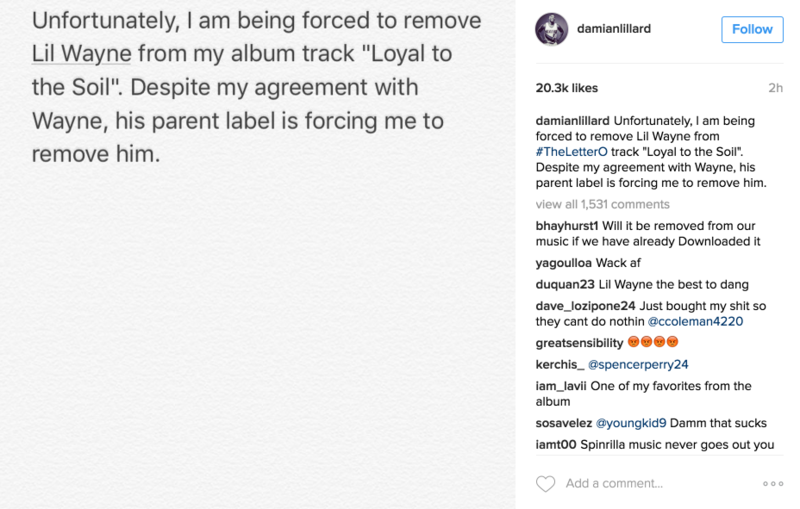 Despite my agreement with Wayne, his parent label is forcing me to remove him,” Lillard wrote on Instagram. As of press time, the track remains intact on streaming services as is but the Weezy removal process could happen as early as tomorrow morning. The rift between Wayne and his former label hub has been particularly cold this year with no signs of either side warming up to any sort of agreement. In May of this year, the Young Money head honcho shut down all talks of resolution because he deemed the money to be funny and ironically in terms of this latest fiasco, he used pro basketball talk in a recent ESPN interview to describe his CMB hardships. It seems Dame D.O.L.L.A. just got in the middle of the beef. And while we’re on the subject, how come Cash Money re-signee Juvenile gets to stay on the album?